The Hetch Hetchy Reservoir, while providing water to millions of people in the San Francisco Bay Area, also provides visitors with access to spectacular beauty and the wilderness of Yosemite National Park. Many hiking trails begin from O’Shaughnessy Dam and some of Hetch Hetchy’s most beautiful features are easily seen from the top of the dam. Hiking information and maps can be found at the Hetch Hetchy entrance to the park and on the National Park Services’ website at http://www.nps.gov/yose/planyourvisit/hetchhetchy.htm. Waterfalls - Take in the Sights - Tueeulala and Wapama Falls are just two of Hetch Hetchy’s waterfalls. Both waterfalls drop more than 1,000 feet from cliffs and are best viewed in early spring (Tueeulala Falls dries up by early summer). Out of view, but accessible by trail, are Rancheria falls and Tiltill Creek, a small seasonal waterfall. 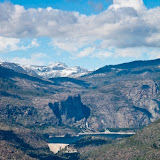 Domes and Cliffs - Hetch Hetchy Dome is located on the north side of the reservoir and Kolana Rock is on the south side. Kolana Rock is an active breeding area for peregrine falcons. O’Shaughnessy Dam - O’Shaughnessy Dam stands 312 feet above the streambed and extends 910 feet in a gentle arch from canyon wall to canyon wall. Hetch Hetchy Reservoir can hold approximately 117 billion gallons of water; is 8 miles long; and has a maximum depth of 306 feet. Tuolumne Wild and Scenic River - Downstream of the O’Shaughnessy Dam, the Tuolumne River is maintained year-round by flows from Hetch Hetchy Reservoir. The water released from the dam supports fish, recreation and wildlife. Several hiking trails into Yosemite wilderness originate from O’Shaughnessy Dam – ranging from easy hikes to strenuous backpacking. Backpackers have several locations to choose from: Pate Valley, Laurel Lake, Lake Vernon, Jack Main Canyon, Smith Peak and Poopernaut Valley. All paths lead to Yosemite’s grandeur and beauty. Wildflowers – Heuchera, California poppy, lupine, wallflower, shooting stars, waterfall buttercups, bright California fuchsia brodiaea, dwarf alpine monkey flower, clarkia and Sierra leisiga. Trees – California black oak, big leaf maple, Ponderosa pine, dogwood and incense cedar. Birds – Steller’s jays, sparrows, woodpeckers, hummingbirds, titmouse, peregrine falcon, bald eagle, golden eagle, red-tailed hawk, common merganser, osprey, great horned owl, robin and Ouzel (American dipper). Wildlife – Black bear, mule deer, mountain lion, California mountain kingsnake, rattlesnake, chipmunk, coyote, bobcat and squirrel.